It's a been close to 4 months since I lost my sweet Smudgie and sometimes it feels like yesterday and other days it feels like it's been forever since I held her. She was my best buddy and little soul mate and I loved her with all my heart. I have 3 other furbaby cats that I adored and love with all my heart but there was just something so very special about Smudgie. From the day I picked her up off the streets of New York as a kitten she had my heart. She got me through so many tough times and was always the first one to greet me at the door, we watched TV together, when I was down she would come right up to my face and rub her little face against my cheek, every night she would sleep on my hip and whenever I sat down that was her cue to sit on my lap. When I worked from home she would hang over my shoulder to see what I was working on........it was a thousand small little things that she did that touched my heart. I miss her so very much. Smudgie was only 9 when she passed away from pancreatic cancer, but even if she was 99, it still wouldn't have been enough time. I thank God that this beautiful creature came into my life and I feel honored that she shared her life with me. There is not a day that goes by that I don't think of her and she is never far from my thoughts, I wish I could see that sweet little face one more time. Over the past few months, I have good days and bad days, today was a bad day, I'm missing her so much and putting it down in writing seems to help. Smudgie - Mommy, Robert, Calie, Sparky, Jade, Grandma & Grandpa miss and love you so much ! I know you are in heaven with our family and hanging with Max, until we meet again baby, Mommy holds you in her heart. Nancy, you are right, it is all those little things that endear them to us, and the love they give us, without ever holding back is so very important in our lives. They love without any conditions, and they are so much a part of who we are. I understand the missing them, and I understand how it can seem like just yesterday, and forever since they was with us. The love and bond shared between you and Smudgie will never end, for it is forever. That is the legacy and treasure that they leave behind. There has been many times in the 2 years that I had to let Harry go, that I have put what I felt in writing. It is an outlet, and sometimes those around us, even those closest to us may not understand the grief felt for losing such a precious and wonderful soul as your Smudgie. As time goes by, I hope that all the memories will bring a smile to your face, even through the tears. Nancy Marie, I am so sorry you are having a bad day. Sometimes it feels like our broken hearts are healing and then the waves of pain fall upon us and bring us to our knees all over again. I have always found comfort in talking with others who understand or in this case, writing about your baby and coming here for support. Smudgie is still with you, in your heart. When you two met she wrapped her little paws around it and she is still holding on. I like to think that our little fur angels are talking to their new friends about the wonderful person who loves him or her and all the special times they shared. If you are not already doing so, talk to Smudgie just as you did before she passed. That may help a lot. As you say, love never dies, no one and nothing can ever break our bonds with those we love. Thank you so much for your kind words, I can't say it enough this site has helped me tremendously. Putting what I'm feeling down in writing and the compassion and support I've been getting from the members of this site has been amazing and so healing. I wish I could give the both of you a big HUG. Your post about your sweet Smudgie girl is so moving, so filled with a mom's forever love and longing. I loved reading your descriptions of her...the sweet little things she would do, the "thousand small little things" that she did as she wove her way into your heart forever over the wonderful years you spent together. It reminds me so much of my sweetest boy, Buddy. He also had so many of these sweet precious ways about him that I will always always treasure...at least a thousand, unique especially to him. So many of us here share similar emotions with you, when it comes to our beloved babies being our little soul-mates, the ones we could always depend on, always turn to for our greatest comfort, especially when life got tougher and harder. My baby was always so tuned into my emotional states and went out of his way to be a loving comfort, whenever I was sad or upset. He never had to learn about empathy, kindness or compassion...these qualities were innate within his sweet spirit, and from how you describe Smudgie, she had these qualities, too. No truer words were spoken...the love never dies. Our sweet babies live on because they are God's special children, they are in the best place they could ever be...no more sickness or suffering...they are young again, so happy and free. Thank you so much for the kind sweet words, they mean the world to me. Thank you for your kind words, I'm feeling better today, thank you. God Bless everyone on this site. Mommy went to the candle ceremony tonight, I hope you and Max saw all the beautiful candles and felt their warmth and love. Mommy misses you so much, tomorrow morning at 8:30 a.m. it's 17 weeks since you went to the bridge. I love you baby, I wish I could see your sweet face one more time and I wish I could feel your sweet face rubbing my cheek. Remember you and Max are so loved ! What a beautiful thought, of your sweet Smudgie feeling the warmth of the candles...they contain so much love and warmth for her. I will be thinking of you today, I hope you can smile through the tears as you know your baby will always be with you...she is well and happy now, and she waits for her sweet mom to join her one day. I am glad that being here is helping you. People genuinely care here...there are people with good hearts here and I am grateful for Ed and staff for continuing to make this a safe and healing place for us to come. I pray that your healing continues and that you always feel Smudgie's sweet spirit close. Thank you so much for the kind words and the hugs of comfort, that means alot to me. I've said it before, this site has been god sent, everyone here has been a blessing. Hugs of comfort and peace back to you. Today at 8:30 a.m., 17 weeks ago you arrived at the bridge. As mommy has been doing for the past 17 weeks, I lit a candle for you at St. Paul's Chapel. I know you heard Mommy say " I love you" because right after I lit the candle I got our "special sign"
and I looked towards the sky and said " thank you". Hugs and Kisses baby.....please tell everyone I miss them. Remember sweetie, the love never ends. Miss and Love you forever. Happy 17 weeks Sweet Angel! You are such a special gift for mom...you had given mommy so much love and this loving bond is eternal! I can feel how much mommy misses and loves you Angel! Be close to her, she needs you! Thank you for your comforting words on my Bedo's anniversary... I am touched by the sweet memories of Smudgie and I know how much she means to you! It is amazing how powerful love could be as it is forever lingered in our hearts! Hugs to you both, thank you so much for your kind words and for wishing my sweet Smudgie a happy anniversary at the bridge. The words expressed by everyone are so comforting for the soul. It's 4th of July and today is 4 months that you arrived at the bridge at 8:30 a.m. I can't believe it, sometimes it feels like yesterday other times it feels like forever. I miss your sweet little face and your crazy antics. Mommy has candle burning for you today baby. love exploding in the sky trying to reach you in heaven. Happy Four Months Angel Smudgie! I'm so sorry I missed your day - I know the kids at the bridge planned the perfect party for such a beautiful girl. What a beautiful thought about fireworks being "Mommy's love exploding in the sky.." I love that - it is a very comforting thought for me because Lee Lee was always terrified of the fireworks...I'm going to remember to think of it like that from now on....Thank you for that! And you are right "The love never ends"
I agree with Melanie - what a beautiful way to think of the fireworks, as a mom's (or dad's) love explosion from the heart! So many of our babies were afraid of fireworks when they were here on earth, but I know they look forward to them now because they are a natural part of their celebrations, a boisterous way of symbolizing our eternal love. 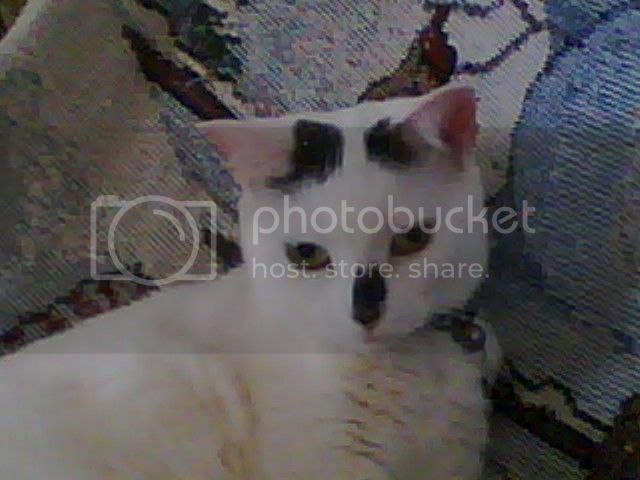 Thank you so much for putting up my sweet Smudgie's picture - thank you thank you thank you. I love that little face. Also, thank you so much for the kind words. Dear Eliose - Thank you as well for the kind words, and yes they all celebrated the 4th together at Rainbow Bridge. Hugs to the both of you. Remember the love never ends. Today is 18 weeks that you arrived at the bridge. Mommy will light your candle today at St Paul's chapel. I miss you sweetheart, but remember Mommy forever carries you in her heart. Thank you for all the signs today......Mommy could just squeeeeze you, I miss our hugs baby. Oh, your sweet little Smudgie is so beautiful! And I love the thought about the fireworks. Brandy was afraid of fireworks until the last year or so when she lost most of her hearing. I guess that was a blessing in disguise. Our Miriam is afraid of them too, so I guess she's carrying on Brandy's tradition. But I love that you described it as our love exploding in the sky for our pets. Thank you for the kind words and hugs. Yes, most of our sweet furbabies are afraid of the fireworks, I know Smudgie didn't like them. I would put on the air conditioner and TV really loud hoping it would drain out some of the sound....poor babies were still scared. So now, all of our angel furbabies can enjoy the fireworks at Rainbow Bridge, they don't have to be afraid any longer. I love the name Brandy, my friend's mom just lost her beloved Rottiweiler Brandy, I loved that dog, she was the biggest mush around. She weighed 125 lbs and she was afriad of her own shadow, but that only made her more endearing. I went into your profile, I wanted to see a picture of your Brandy, oh my god what a cutie ! I went to Carvel Ice Cream last night because the weather has been so hot and humid. I hadn't been there in over a year so when i ordered a medium cup of soft vanilla ice cream the server said to me ..I know and a toddler cup for your Kitty. My eyes started filling up with tears as I explained to him you had passed, he felt so bad I thought he was going to cry. I went home to have the ice cream and it brought back all the sweet memories of your looking in the big and then following me to the couch to have your ice cream. Of course you wouldn't eat it out of the cup, you had to eat it off the little plastic spoon that came with the ice cream. If would take you forever to lick the ice cream off the spoon while Mommy's ice cream sat melting....LOL. But you were insistent you wanted it off the spoon and you sat like a little lady next to me patiently waiting for each spoonful. I miss you sweetie....every time Mommy eats vanilla ice cream, I whisiper..." this is for you Smudgie"....do you hear me? I hope you are enjoying all the vanilla ice cream your little tummy can hold. Remember, Mommy's love never ends. Sweet letter to your sweet Smudgie! Of course they serve vanilla ice cream at the bridge....it goes so well with carrot cake!! Writing letters to my boy in the first year brought much comfort to my soul. I know the pain you're going through and my heart breaks for you. The pain....the deep feelings of loss are just too much to bear. You wonder how you will move on without the love of your life sharing your days. Life seems too unfair when we lose someone so precious and dear. My thoughts and prayers continue to be with you. Oh Nancy, that made me smile and cry at the same time (about the vanilla ice cream). Brandy just loved ice cream and every time we would say "do you want to go for ice cream" she would jump up and start running to the back door. We would either go to Dairy Queen or a neighborhood ice cream store and she always got a few licks of whatever cone we had. On her birthday we always got her ice cream too (along with her own hamburger). Such precious memories we have and thank goodness we do. I hope Brandy and Smudgie are together at the bridge enjoying their ice cream together. I'm not sure I can put precisely into words what I want to say but I'm going to try. When that server at Carvel remembered you and Smudgie after a year I really think that was one of the greatest tributes to the two of you, and the relationship you two had, that could be given-despite all that would have happened to him in the time since he last saw you he still knew you and what you traditionally ordered. And the bit about the toddler cup is just priceless-after all, our pets are our kids in so many ways, kids who just never totally grow up, and that size ice cream seems to just fit. I'll bet Smudgie is a regular at the Rainbow Bridge Carvel and just like you think of her you are undoubtedly in her thoughts as she eats her vanilla. I finally figured out how to upload photos...woohoo. Sometimes I think I have a handle on things and then something as simple as vanilla ice creams starts the emotions running wild again. I know all our sweet babies are at the Bridge eating vanilla ice cream and carrot cake and hamburgers or what else their hearts desire. Kisses to all of them !! Big Hug to Mare & Barb and Soothspader. Mommy's beautiful girl......I miss you sweetie. Thank you so much Melanie, I'm sure Smudgie and Lee Lee are enjoying their ice cream at the bridge. Peace and comfort and a Big Hug to you. What a touching story of you and sweet Smudgie sharing your ice cream at Carvel! I agree with soothspader's observation - the fact that the man who served you both the ice cream remembered the two of you after all that time is an amazing tribute to your love and how your love shone in the world to others. Congratulations on coming up the learning curve, re: photos. Your baby is so adorable, thank you for sharing her sweetness with us. That picture with her looking directly at the camera is priceless. If I live to be 100, I don't think I can ever eat another vanilla ice cream cone or vanilla pudding (another one of her favorites) and not think of my beloved Smudgie. Sending you a big hug back. Oh Nancy, the ice cream story is so precious and beautiful - it brought tears to my eyes. Smudgie is such a gorgeous cat. You can see so clearly the love the two of you shared through Smudgie's eyes. Living without their physical presence is so devastating, it is so hard to get through these difficult times, no matter how much support we have. Thank you so much for the sweet words, she is my sweet sweet angel. As long as I live I can never eat another vanilla ice cream cone and not think of sweet Smudgie. There had been times that someone would be over my house eating an ice cream cone and she would sit and stare at them, if they ignored her, she would jump in their lap and try to get a lick for herself...it cracked me up everytime. 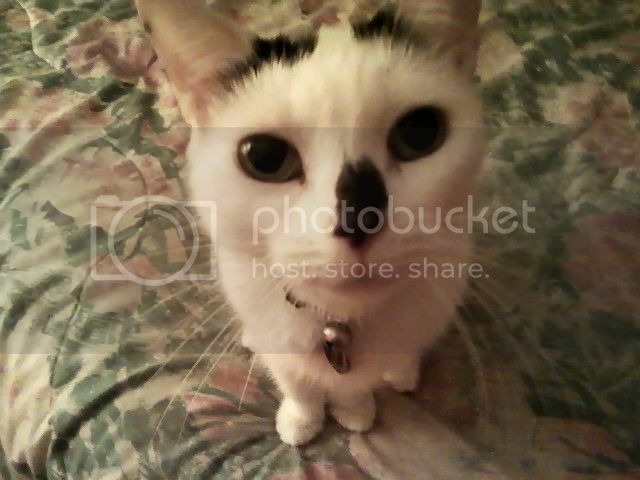 Kelly, enjoy your ice cream tonight with your kitties and give them an extra scoop in memory of my beloved Smudgie girl. I know all of our beloved furbabies are at the Bridge enjoying ice cream and all sorts of special treats. It's 19 weeks today that you went to Rainbow Bridge, how is that possible. It might be 19 weeks on the calendar, but in my heart time has stopped. I had to get my car serviced today at the dealer and while I was filling out the paper work they had one of those calendars that you can see the full year and automatically my eyes went to March 4th.....I hate March 4th. I know it's the day you were released from your illness, and I want to "not hate" that day, but it's also the day you left and I can't help but "hate it". I asked the mechanic when was the last time I was there and he said October and like with everything else I think " Smudgie was alive in October". My days now consist of before Smudgie passed and after Smudgie passed. I know you want Mommy to be happy, I'm trying, I really am.....but Tuesday will always be hard. I have your angel candle burning, can you see the flame from the bridge? I love you baby, I hope you are having a blast with all your new friends......Mommy has talked to so many of their Moms and Dads on this website and they all sound amazing !! P.S. Calie, Sparky, Jade, Grandma, Grandpa, Uncle Rob, Aunt Jeannie, all miss you too. Thank you for the kind words and yes, I'm sure there is ice cream at the bridge along with all the other treats our babies love.